The international effort to save the cheetah, the world’s fastest land mammal and Africa’s most endangered big cat, will be explored by Dr. Laurie Marker, founder and Executive Director of the Cheetah Conservation Fund, in a special SINHG Evening Program on Tuesday evening, March 27th. 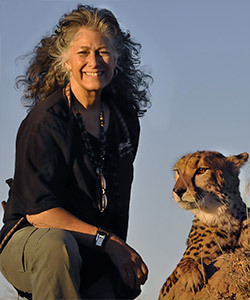 Dr. Marker, who has worked with cheetahs since 1974 and earned her doctorate in the subject from Oxford University, established CCF’s research and education center in 1990 in Namibia, home to the world’s largest population of free-ranging cheetahs. Since then, CCF has expanded its reach with offices in the United States, Europe and Asia. Once numbered in the hundreds of thousands throughout Africa and Asia, there are fewer than eight thousand cheetahs surviving today, almost all of them confined to rapidly shrinking habitat in Africa. “We’re a conservation organization working to combat the problems that afflict the human communities that live alongside cheetahs and threaten the cheetah as a species with extinction,” Dr. Marker describes CCF. Dr. Marker’s illustrated talk will explore the variety of methods and practices CCF has developed to minimize human-cheetah conflict and ensure a future for this highly endangered animal. Cheetahs are uniquely adapted for speed, capable of sprints at more than sixty miles per hour during the hunt, a speed it can attain in little more than three seconds. With its long legs, slender body and specialized physiology, the cheetah is sometimes referred to as the greyhound of cats and is so different from other felines that it is the only member of its genus. All Seabrook Island residents and guests are welcome at SINHG Evening Programs, which begin at 7:00 pm with refreshments and fellowship followed by the program at 7:30 pm. There is a $5 donation for non-SINHG members. Membership information can be found here. This entry was posted in Events, SINHG. Bookmark the permalink.